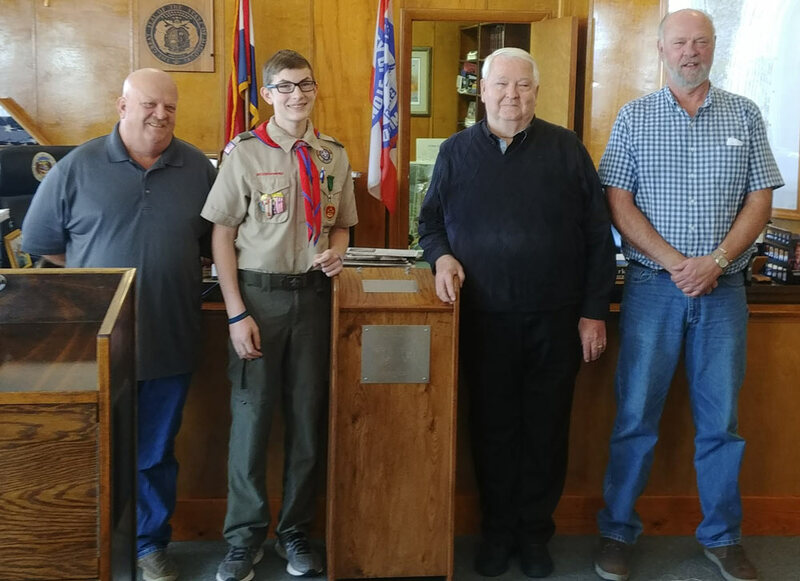 Jacob Martin, second from left above, stands with the Stone County Commission and the flag retirement box he built as part of earning his Eagle Scout designation. From left to right, Mark Maples, Jacob Martin, Dennis Wood and Hank Smythe. Jacob Martin, a freshman at Galena High School, recently completed a project to earn his Eagle Scout designation. Jacob built and placed two flag retirement boxes in the area, including one in the Stone County Courthouse in Galena. Martin constructed two flag retirement boxes, placing one in Galena and another at Central Bank in Highlandville. “Over the years, I have received flags from people within the community asking me to take the flags to my Boy Scout Troop for retirement. Since my troop is in Nixa, I thought it would be nice for people living in the Galena and Highlandville areas to have a place to retire their flags as well,” Martin said. The flag box presentation completed the last requirement needed to submit his request for the Eagle Scout rank. Jacob passed his Eagle Board of Review on Wednesday, December 26, 2018, and is now an Eagle Scout with Troop 200 in Nixa. The finished flag retirement box was delivered to the Stone County Commission on Tuesday, November 6. “We had a metal plaque made that explains some of the reasons flags need to be retired and who we are that are placing the box,” Martin said. Martin has participated in Scouts since first grade when he joined Cub Scouts. Jacob also participates in the Galena High School Band, where he plays trumpet, and the cross country and track and field teams. He is also a first degree blackbelt in taekwondo. His parents are Shannon and Julie Martin of Highlandville and grandparents are Marilyn Greenway and Reatha Asher-Lloyd, both of Nixa and the late Jim Martin of Galena. Special thanks to Mr. George Pezold and Vietnam Veterans Association Chapter 1119, without whom this project could not have been completed.